Who else loves sweet potato? We do! You can make so many different dishes from this wonderfully colourful food. 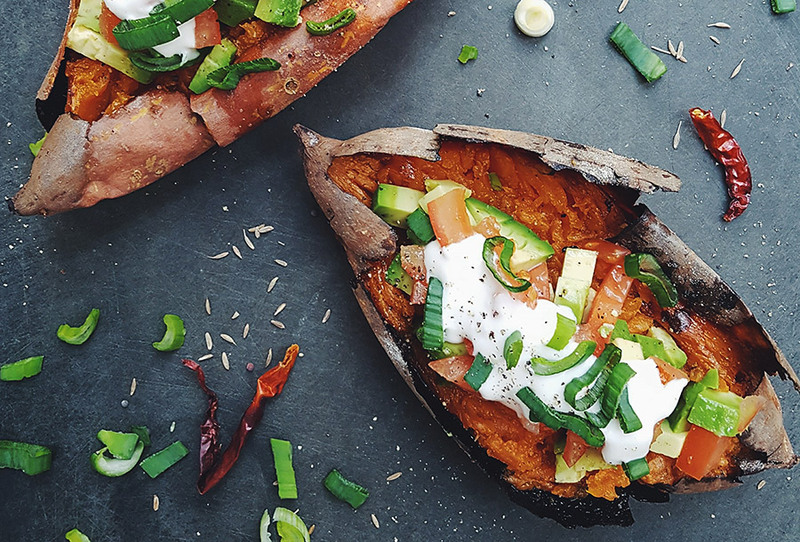 Here’s our recipe for stuffed sweet potatoes. Easy to eat for kids and a yummy dish for the adults to enjoy to! Great for snacks and lunches. Place the bacon on a microwavable plate, cover with kitchen roll and cook on High MICROWAVE for 2 minutes. Leave to one side. Cook the sweet potatoes on the auto program jacket potatoes (see page 60). Leave them to cool. Slice the sweet potatoes in half lengthways, scoop out the flesh and place into a bowl, add the crème fraiche, spring onions and half the cheese to the bowl, mix together well. Spoon the filling back into the potato halves. Chop the bacon and place some on top, followed by the remaining cheese. Place the potato halves onto the wire rack on the enamel tray and cook on Grill 1 for 3-6 minutes or until golden brown.